I was born in Indonesia where my parents were missionaries with TEAM for over 30 years. I loved growing up in the jungle and attending high school in the Philippines. Seeing how the Gospel transformed the tribe my parents worked with from one of fear, witchcraft and animism to one of peace greatly impacted my desire to become a missionary myself. I graduated from Moody Bible Institute with an International Missions degree. I met my wife, Pattie, at Moody. When we both completed our studies at Moody, we began the process to serve as missionaries with TEAM. 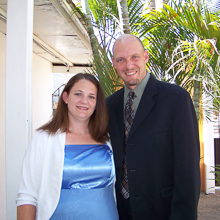 We began ministering in Southern Baja, Mexico during a 9 month internship in 2002. After completing our internship, we were accepted full time with TEAM, formed our support team and attended language school in Southern Texas. We returned to Mexico in 2006. We assisted in developing a youth program for a TEAM church plant in the city of San Jose del Cabo during our first term of service. We currently serve in the capital city of La Paz as part of a church planting team. I grew up in a Christian home where my love for missions began. I graduated from Moody Bible Institute with an Urban Missions degree. I met my husband, Phil, while at Moody. Phil’s parents were missionaries with TEAM. When we both completed our studies at Moody, we began the process to serve as missionaries with TEAM. We began ministering in Southern Baja, Mexico during a 9 month internship in 2002. After completing our internship, we were accepted full time with TEAM, formed our support team and attended language school in Southern Texas. We returned to Mexico in 2006. We assisted in developing a youth program for a TEAM church plant in the city of San Jose del Cabo during our first term of service. We currently serve in the capital city of La Paz as part of a church planting team. We are helping with a new TEAM church plant in the M?rquez de Le?n (MDL) neighborhood of La Paz, the capital of Southern Baja. Our vision is to live in MDL and begin a community center ministry in order to build His Kingdom there. We also assist with ministries that take place at Rancho el Camino a nearby TEAM ministry initiative that also serves the MDL neighborhood and surrounding area. We have seasonal horse ministry outreaches where children and youth are brought out to the ranch to experience the horses, be loved on and hear about the Lord. The ranch also hosts many different church groups. We have also developed some wonderful partnerships with several governmental agencies such as the department for the development of the family and the at risk youth program of the local police department.